In December 1813, a British Expeditionary Force was sent to the Netherlands to support an uprising against the French Napoleonic Empire. Among the force’s goals was to ensure that the British had a say on who controlled the Netherlands once Napoleon was defeated. As importantly it had the mission of capturing or destroying the French fleet at Antwerp. The force was plagued with problems from the very beginning. The bulk of the British Army was in the Peninsula with Wellington, while the remnants were spread across the globe. The nascent war with the United States had added a further drain on those units that might have been free for the expedition. A strength of 8700 men was originally proposed by the government, however the effectives (those fit for active service) that could be found was less than 7700 men. Additionally, the majority of the battalions were the 2nd or 3rd Battalions of a regiment. These battalions traditionally were used to trained new recruits for the 1st Battalion that was deployed overseas. The cadre often consisted of very junior officers and non-commissioned officers who were old or in poor health. Although all of the battalions had a sprinkling of veterans in the ranks, many were invalids sent home because they could not stand the rigors of active campaigning. Compounding all of these problems was the scarcity of qualified general officers to lead the expedition. General Thomas Graham was chosen as the commander, but he had left the Peninsula due to health issues only a short time before. He had recently turned 65 years old, which even by modern standards was a bit old for fighting a war. His subordinate generals were a mixed bag, with at least one, Major General John Skerrett, could be considered the most incompetent general to have served under Wellington. All of these problems might have been mitigated if the force had a well functioning staff to support the commander, however, like the rest of the force, it was put together from scratch and consisted of officers with who had more enthusiasm than experience. All and all this did not bode well and the campaign, like many of the other British efforts of the period, was a disaster waiting to happen! Hundreds, if not thousands, of books have been written about the British efforts in the Peninsular War. Even smaller endeavors such as the Buenos Aires Invasion of 1806 and the Walcheren Invasion of 1809 have had at least one and two books written about them, respectively. But not much is written about the 1814 Expedition to the Netherlands. John Fortescue covers it in his mammoth History of the British Army but the four month expedition only receives a scant 55 pages. In 1884, the British Army published the book British Minor Expeditions. Only 9 of its 91 pages cover the expedition to the Low Countries. A review of the memoirs of the period also shows a paucity of sources. Mr. Bamford was able to find about a dozen different diaries, memoirs, and primary sources written by British soldiers. Fortunately, these are quite extensive! A Bold and Ambitious Enterprise is the first book in English that covers the campaign. Mr. Bamford sets the stage by exploring the British government’s goals and its reason for conceiving the idea of the expedition. He then examines how it built the force and the problems it ran into doing so. Since many of these problems were systemic to the British regimental system, i.e. the 2nd Battalions not being expected to deploy on active service, they would have a far greater impact on the campaign then it would first seem. The author also explores in great detail the problems with his allies that General Graham ran into once he arrived in the Netherlands. By early 1814, the Low Countries were a secondary theater to the war effort and was treated by such by his allies. General Graham not only had to deal with the emerging Dutch nationalism but also ensure that the Prince of Orange’s goals were not in direct conflict with his own. Furthermore, although supposedly there was a unified allied command structure in the Netherlands, who was in charge appeared to have fluctuated weekly and besides the Dutch, the British had to coordinate with Russians, Swedes, Prussians, Saxons, and Hanoverians. Often these forces were just passing through to support their own armies fighting elsewhere. After a few months, General Graham realized that he would not be able to take Antwerp with his available forces and turned his attention to capturing the city of Bergen-op-Zoom. What ensued was the worse British defeat since the disastrous expedition to capture Buenos Aires in 1806. Graham did not have the siege train or troops to engage in a formal siege, so he decided to try and capture the fortress with a coup-de-main, with a force of about 5,000 men. Things went wrong from the very beginning and by the time the night was over, half the force would be casualties, with over 1600 being captured. Among the casualties were 1 general killed, two generals captured, one of whom would die of his wounds. The only general who did not become a casualty was General Graham, who did not take part in the actual assault. Two-thirds of A Bold and Ambitious Enterprise covers the battles, skirmishes, and sieges that the expedition fought. Almost 100 pages are devoted to the Bergen-op-Zoom fiasco. Mr. Bamford draws heavily on the official correspondence and brings it to life with eyewitness accounts, all of which were by junior officers and enlisted soldiers. He also includes four battlefield maps that portray the maneuvers and actions of the forces. Unlike some books, these maps are appropriately placed so the reader can easily refer to them. In the grand scheme of things, the British expedition to the Netherlands had little impact on the outcome of the war. Despite its battlefield failures, it did cement a close relationship with the Dutch, which would pay many dividends 15 months later during the Waterloo Campaign. Andrew Bamford has written a long overdue history of the campaign that is easy to read, but very thorough. He does not shy away from placing blame where it rightfully belongs, but gives credit to those who deserve it. One thing that his writing brings forth is the character and bravery of the British soldier, who endured incredible hardship to achieve so little. 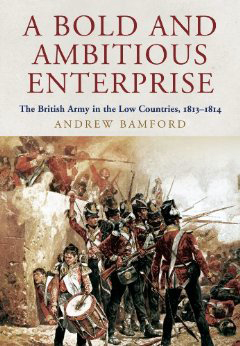 Although A Bold and Ambitious Enterprise is about a campaign that was over-shadowed by the great events happening elsewhere, it is a must read for those who follow the Napoleonic Wars and the British Army in particular. Graham had only been home for six weeks before he was offered the command. Compiled by the Intelligence Branch of the Quartermaster Department.